So many fancy and hipster cafe places open in Jakarta, but none so far like the hipster, healthy / organic cafe, Alchemy that I visited in Ubud, Bali. With people's growing concern for their own health, I'm pretty sure, the organic / vegan market is growing substantially here. Surely this megapolitan Jakarta will have market for that, right? 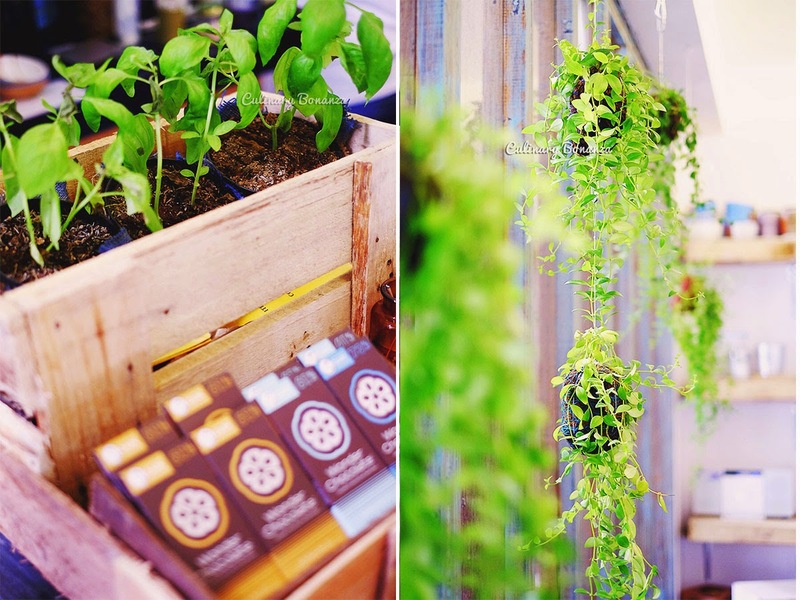 First dedicated organic / healthy cafe in Jakarta? So upon knowing (from Instagram) about this seemingly hipster and healthy cafe, which opened very recently, I didn't need to think twice to decide to visit it, right after gym today. I had not have my lunch yet anyway. On its Instagram page, @SNCTRY serves healthy food bowls, pretty much like the #BreakfastBonanza that I often made at home, as well as cold-pressed juice and smoothies, so I suppose should make a perfect post-gym nourishment! Someone actually asked me how to pronounce the name, well, I believe the name is (probably) simply a collective of the consonants from the word 'sanctuary', which I suppose is what this place strives to be: a peaceful sanctuary for the healthy-conscious minds. I had difficulty finding it because I missed the sign, while it's actually located just next to Plataran Dharmawangsa, at this newly renovated commercial building/complex, Pelaspas Dharmawangsa, which will house a few other new F&B establishments in the near future. SNCTRY itself is quietly nestled at one corner of the complex, accessible from outside. It's a very small cafe/space, mind you, so do not expect to be able to run inside. There are only a few stools outside (but it's over run with ants), a table that seats 4 and a kitchen island also fits 4-5 pax at the maximum, inside. So, if the place gets packed, maybe a take away would be a better idea. 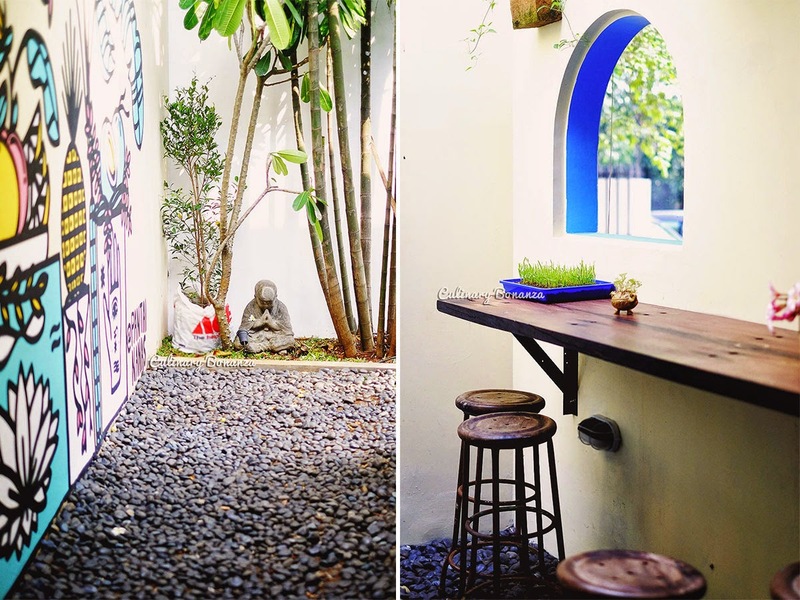 Upon first look: it is a hipster place in every sense: it's small, it has quirky mural at the entrance, they grow some of the greens used to make the smoothies on their own and it serves healthy menu for segmented market who are into this type of nourishment. SNCTRY's menu offers all things healthy and green: cold pressed juice, smoothie, almond mylk, infused water, salad, super food bowl with various choice of add-ons and small treats (which the owner will update on later dates). So I had the Beetroot Mashed Potato Salad with chickpeas, cherry tomatoes, some greens, beef bacon bits and wasabi mayo dressing, as well as Cafe Kiss smoothie (cold-drip coffe, avocado, almond mylk and dates). Although located outside the premises of a shopping mall, do not expect the price of goods here to be any cheaper, in fact they're on par. I didn't ask if the salad used organic vegetables, which would explain the price of the salad, though admittedly, for the same price, I would most likely get a bigger serving of salad elsewhere. That being said, the salad was actually quite tasty and healthy for sure. You see, I don't always or only visit fancy, expensive or pricey places. I may not have clocked that many hours when it comes to street food, but as a self-proclaimed hipster foodie, it is for this sort of places that I strive to discover and share with you, simply because I think it's worth sharing. If you happen to be in the area and you're feeling Saintly and wants to have healthy stuff, this might be the sanctuary for you.